You’re going to have to sue. At some point in your writing life, you’re going to have to sue to get paid. Thankfully, it doesn’t happen often. It happens to me about once every five years. The process of suing for payment in New York City’s small claims court is time consuming, but not at all unpleasant. Currently, you can sue for a maximum of $5,000. It may be that the offending magazine or Web site, especially if it’s a larger one, will settle before your court date. Paying their high-priced lawyer to deal with your small claim often isn’t worth it for them. Here’s a good example of what might happen if you sue. Years ago, I wrote a cover story for a hip travel magazine. I profiled two artists who, every few months, would place themselves in dire, dangerous situations in order to paint animals in the wild. In this case, the story took me to South Africa. My assignment was to accompany the artists as we traveled three hours outside Cape Town to dive for great white sharks. As four white sharks circled our vessel (each longer that the small boat), I knew this would be one of my great adventures as a writer. I billed for both the story and for expenses. The expenses totaled as much as the story itself. After six months of waiting to be paid, I took to the courts to resolve the situation. I sued the editor in chief, who had become less than affable about payment. I had my contract. I had my expense receipts. And I had a blue file folder full of emails that promised pay ‘soon.’ You’ll need this kind of evidence as well. But what happens when you go to court? 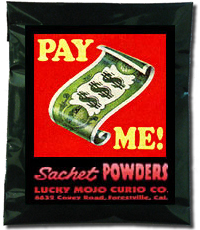 Well, you don’t have to bring in ‘magic’ Pay Me Powder as in the graphic below. I’ll tell you exactly what you can expect in the next post.